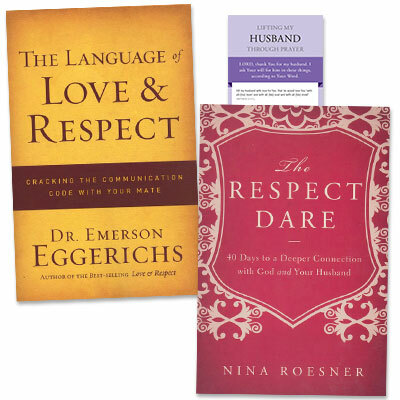 Purchase The Respect Dare and The Language of Love & Respect at the special price and receive free the Lifting My Husband through Prayer card. “A long and happy marriage.” It sounds like the end of a fairy tale— an illusion that modern times have exposed. An in-depth study about why your communication styles are not wrong, just different. Finally an answer for the number one problem in marriages—communication! This analysis of the vital principles of cross-gender communication helps couples recognize they speak two different languages. They are sending each other messages in "code" but won't be able to crack that code until they realize that she listens to hear the language of love and he listens for respect. Most advice on this subject fails to convey that husbands and wives are wired very differently, and when those wires get crossed, the communication sparks can fly! Dr. Eggerich's best-selling book, Love and Respect, launched a revolution in how couples relate to each other. In The Language of Love and Respect he shares how that message can be applied. Formerly titled Cracking the Communication Code. What can happen when we pray? Prayer is powerful—because God, and our relationship with Him, is powerful. This easy-to-use prayer card equips you to bring your husband to the God who sees, through prayers full of God’s own words from Scripture: prayers of character, purpose, and hope.